Celebrated Chef Gino Campagna knows a BIG secret: ANY KID CAN COOK! The recipes in this book are simple, easy to follow, and best of all—TASTY! They’re also open-ended so you can add your favorite flavors and creative flair. Inside young cooks will find delicious and nutritious dishes, from basic pasta and pizza doughs to Ginestrone (aka minestrone) soup and Guac Amore (aka guacamole) to French toast grilled cheese and Fruity Pops, that the entire family will enjoy preparing together. After all, cooking is a team sport! So what are you waiting for? 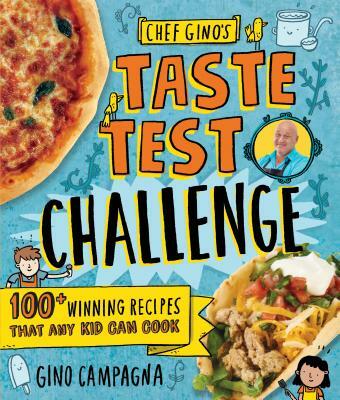 Step into the kitchen with Chef Gino, challenge your taste buds, and most importantly, HAVE FUN! For more than 15 years, Chef Gino Campagna has made it his personal mission to raise kids’ food IQs and help fight childhood obesity. His philosophy? If kids are involved in their food choices and preparations, they will be more motivated to try new, nutritious foods. In addition to starring in the kids’ cooking shows Kitchen Kids on YouTube and Gino’s Kitchen on the Disney Channel, serving on Jamie Oliver’s Food Revolution team, and making guest appearances on A&E’s Emmy Award-winning show Born This Way, Chef Gino teaches kids to cook in Los Angeles and Italy. You can visit him online at chefgino.club. Mike Lowery has illustrated everything from greeting cards to children's books to packaging for snack cakes. He is the author and illustrator of the award-winning Doodle Adventures series, which teaches and encourages kids to draw. He lives in Atlanta, GA, with his wife and daughter in a little house where he is constantly drawing. See his daily sketchbook drawings (which include his collection of bizarre facts) on Instagram @mikelowerystudio.